Duncan’s degrees include a Bachelors, B.A., in K-12 Music Education from the University of Idaho and a Masters, M.M., in Jazz Pedagogy from the University of Northern Iowa. Beginning in high school and continuing into his graduate studies, Duncan’s musical talent was recognized through various scholarships, stipend awards and graduate assistantships. 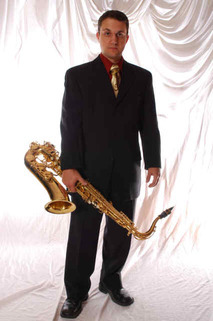 Through his career Bamsey has enjoyed playing bass, baritone, tenor, alto and soprano saxophones as well as clarinet, flute, piano, bass and drums. Duncan has performed in all and directed several types of ensembles including concert bands, marching bands, wind ensembles, saxophone quartets, jazz combos, jazz bands as well as solo work. For 8 years Mr. Duncan, as his students affectionately call him, served as the Director of Music Education at Kinetic Energy School of Movement and Music. Duncan has over a decade of private music lesson and small group teaching experience. Duncan leads his own Latin jazz group, The Standing Man Trio. Active in the local music scene, Duncan freelances for combos, jazz bands, dance bands, island bands, Latin bands, funk bands and rhythm & blues bands including LT Smooth, Charles Brotman, Kahulanui, Nathan Aweau, Damon Williams, Bump City, Jr. Watson, Full Circle, Bula Akamu, Gene Akamu, Salsa Latinos, Bolo Mikiela Rodrigues, Brian McCree, Lary Dupio, Kevin Teves, Uncle Don Kauila, Olga Salvatore's Combo's, Quadrilateral Jazz Quartet, Bill Shepard Big Band, Al Denny Orchestra, Checkers & The Blue Tones, the Cedar Valley Big Band, Funky Pickers Gil, Joe Coville’s Jazz Combo, Allen Rosen, Pele's Passion, Magic Sands, Vertical Mist, Primal Nature, Greg Shirley, Ollie Michell and The Olliephonics Little Big Band. Duncan has jammed with musicians Anuhea, John Cruz, Pana Jones, Kimié Miner, Lorenzo's Army, Jasmine Crowe, Colin John, PanchoMan Band, Wayne from Natural Vibrations, Kapali from Lahina Grown, CJ from HI Town, KC from KC and the Sunshine Band, Alan Chaput and Grant from Mix Jah. A few memorable performing groups were the University of British Columbia’s Honors Band, the Canadian Youth on Tour Jazz Ensemble, the University of Idaho Jazz Band 1, the University of Idaho Swing Band, the Iowa College All Star Band and the Grammy nominated University of Northern Iowa Jazz Band 1. Recordings that have used Duncan’s talents include Grammy Nominated "Hula Kui", "Alonzo Spirit", "Cosmic Cadillac", “Hope You Are Home”, “Roving Reporter” , “I am Happy” , “Reflections” , and “At Dusk” captured at studios such as Catamount Studios, Palm Records, Lava Tracks Studio, Soul Kitchen Studio, Mudd Group Studio, In The Attic Studio and live at Russel Hall. Raised in British Columbia, Canada, Duncan has played in the United States for the past 20 years. In that time he has worked in music retail stores and music repair shops such as Ray’s Midbell Music, West Music, Saxquest and Tenor Madness. Duncan has also been an educator in the public school systems at Washington Middle School (IA), Moscow Jr. High (ID), Hellgate High School (MT) and Peet Jr. High (IA). He has lent his assistance to major music festivals such as the UH Ho'olaule'a, Lionel Hampton Jazz Festival, the Tall Corn Jazz Festival and the International Association of Jazz Educators. Duncan continually indulges his love for the saxophone by sourcing vintage and professional saxophones for boutique saxophone shops, performance and teaching. When Duncan is not consumed by saxophones he is likely with his wife Ranae Keane-Bamsey SCUBA diving, kayaking or biking on the Big Island of Hawaii where they currently reside. Duncan is enjoying learning the local favorite, ukulele.